Have you heard of Annie at www.byannie.com? I first met her last year at Quilt Fest in Provo, Utah, when I took two EQ classes with her. She is an excellent teacher: patient, knowledgeable, fun. This year at Quilt Fest in St. George, two of my friends took a different class with Annie. They loved the bags they made, and so did I! 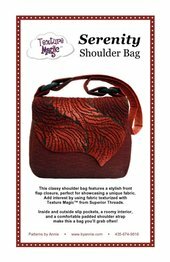 The pattern she used was Serenity, pictured at right, a shoulder bag which features two great products: Soft and Stable (by Annie) and Texture Magic (by Superior Threads). Soft and Stable allows the bag to keep its shape without bulk or extra weight. Texture Magic shrinks the fabric by about 30%, producing a fun texture to any piece you apply it to. I can't wait until I am done preparing for the Holiday Festival next week, so I can purchase this pattern (along with Serenity II, a bit larger than the first one). I will post a picture when I complete the bags. In the meantime, have you tried Annie's products?